Where to find Beirut hotels near an airport? How can I find hotels in different Beirut neighborhoods? Where can I find hotels in Beirut that are near tourist attractions? There is a wide range of accommodations for those visitors chasing a cheap or luxurious place to stay in or near Beirut. Expedia's extensive and up-to-date database features 101 hotels within a 0.1-kilometre (0.06-mile) distance of central Beirut. While Beirut can't boast to having a wide selection of hotels and apartments right near the heart of its city center, The Smallville Hotel should be close enough to satisfy most visitors. Jounieh is a popular accommodation neighborhood. Jounieh is 17 kilometres (11 miles) from the center of Beirut and boasts 15 of our hotels. 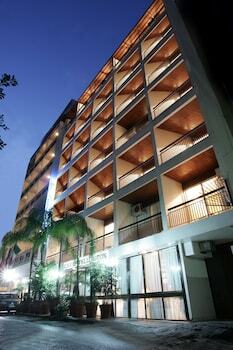 Accommodation options here include the Regency Palace Hotel and Portemilio Hotel And Resort. Another popular place to stay is Broumana. 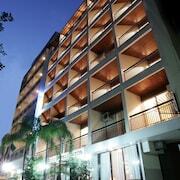 Broumana offers the Grand Hills, a Luxury Collection Hotel & Spa, Broumana and Printania Palace. Or, try Beit Mery, where you'll find the Hotel Al Bustan and Hotel Wakim - Self Catering. 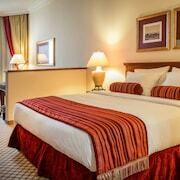 The City Suite Aley and Kayan are located in Aley, while Gems Hotel and Marble Tower Hotel are part of the Hamra area. The InterContinental Le Vendome Beirut and the InterContinental Phoenicia Beirut are very conveniently located if you'd like to stay near the Pigeon Rocks. 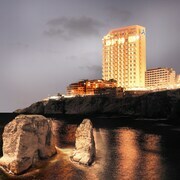 The InterContinental Le Vendome Beirut is 1 kilometre (1 mile) away from the Pigeon Rocks. 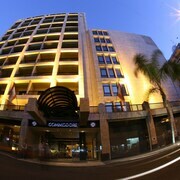 The InterContinental Phoenicia Beirut is 3 kilometres (2 miles) away. Students, families and the more budget conscious can choose from lovely Beirut accommodation options that definitely won't raise the bank manager's eyebrows. The Monroe Hotel Beirut is 4 kilometres (3 miles) from the main part of Beirut, while the Gefinor Rotana is 4 kilometres (3 miles) away. 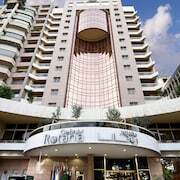 Some more options at the lower end of the spectrum in Beirut are the Coral Beirut Al Hamra Hotel and the 35 Rooms. The Le Gray is 3 kilometres (2 miles) from the heart of Beirut. Another option is the Four Seasons Hotel Beirut, which is located 4 kilometres (3 miles) away. Alternatively, book the Movenpick Hotel Beirut or the Le Royal Beirut Hotel by BlueBay. Hamra is 5 kilometres (3 miles) to the northwest of Beirut and is home to the Agial Art Gallery and AUB Museum. 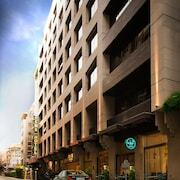 Should you wish to stay in Hamra, check out the Britannia Suites and Sofitel Beirut Le Gabriel. 17 kilometres (11 miles) to the northeast of Beirut, you can also stay at Jounieh, home to the Bay Lodge and Princessa Hotel. The Our Lady of Lebanon and Teleferique Gondola are a couple of the more popular places to explore should you visit Jounieh. Rafic Hariri International Airport is situated 5 kilometres (3 miles) from Beirut. Travelers who wish to stay nearby, you can book a room via Expedia at the Hilton Beirut Habtoor Grand or Warwick Palm Beach Hotel. What are the most popular Beirut hotels? 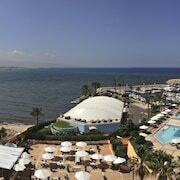 Are there hotels in other cities near Beirut? What other types of accommodations are available in Beirut? Explore Beirut with Expedia.ca’s Travel Guides to find the best flights, cars, holiday packages and more!